LishaBora's business model has been in an innovation and re-design stage over the last year. Throughout these changes we've gotten many questions from our investors. It made us realize, that if our investors have these questions, it's likely the general public does too! So we've compiled all of these questions and have developed this SAWA Series (Someone Asked We Answered) in spirit of the Kenyan culture where we hear "sawa sawa" on the daily. This month we're focusing on our revenue model. Question: How do you make money? LishaBora started out as a hydroponics company, manufacturing high quality barley fodder to supplement a cow's diet. If you want to read more about the history of LishaBora, check back to our earlier blog post. With so many feeds on the market, quality control methods are not standardized, and farmers may end up purchasing sub-par feeds that are cut with filler materials. LishaBora set out to fix this issue in the industry, with a socially-minded action plan. The business model went through a couple rounds of iteration, before we landed on a final model that scales our high-quality dairy products through dairy traders. This product included our Jawabu Dry Feed Solution. 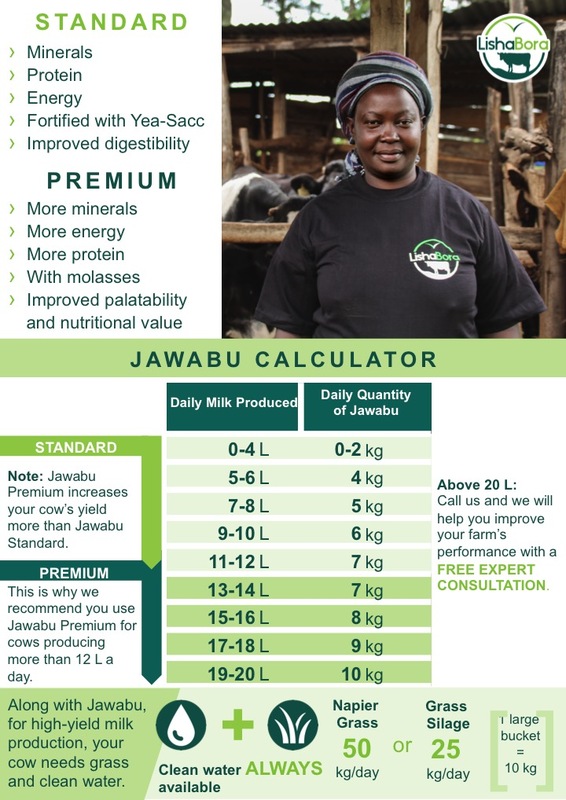 We initially started with only one product - Jawabu Premium 70 kg. This was geared towards high-yield milk producing cows. Through extensive market research and customer feedback, we made the decision to diversify our range of products and available quantities. To ensure a cow's health and nutritional requirements are met, cow feeds require a certain amount of energy and protein content as specified by KEBS (Kenya Bureau of Standards). We work within our own team of experts to formulate a premium and standard cow feed that meets the KEBS certification requirements, while being affordable to our customers. We tested out various feed manufacturers, eventually partnering with Sigma Feeds. We conduct monthly lab analysis on our feeds to ensure our raw suppliers remain consistent with their quality. Sometimes we change suppliers due to climate restrictions such as as prolonged drought or rain which affects the quality of our main ingredients: maize germ, wheat germ, wheat bran and sunflower seed cake. Sigma has it's own set of quality assurance and quality control (QA/QC) processes vetted and approved by LishaBora. Our raw ingredients come from suppliers all over East Africa. Once our product has been prepared, tested and packaged at the Sigma Feeds plant, a LishaBora representative collects the items and prepares them for distribution. We distribute our products to our warehouse in Kambaa and Uplands of Kiambu County, and directly to traders who buy our products in bulk. 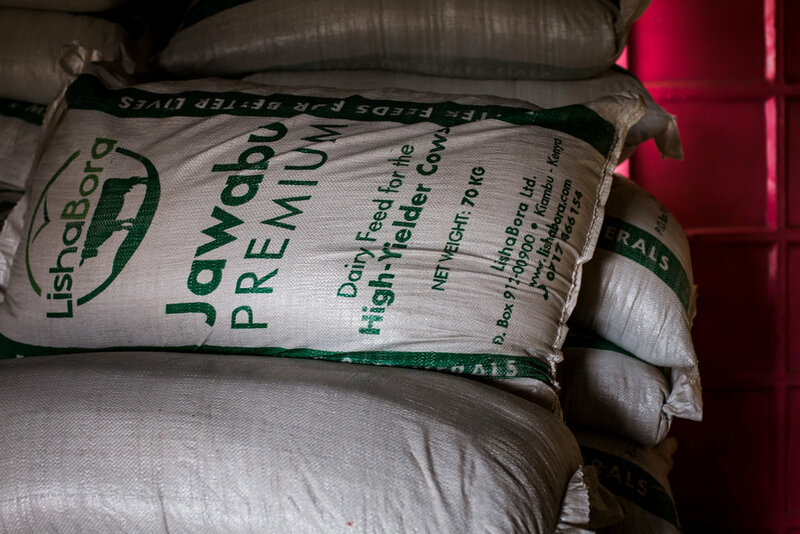 Smallholder farmers can pick-up our products directly from one of our partners distributing our feeds or from one of our warehouse locations. We hope you found this series helpful! Stay tuned for next month's series where we answer what our scaling plans are to increase our revenue streams through the LishaBora business management mobile application!